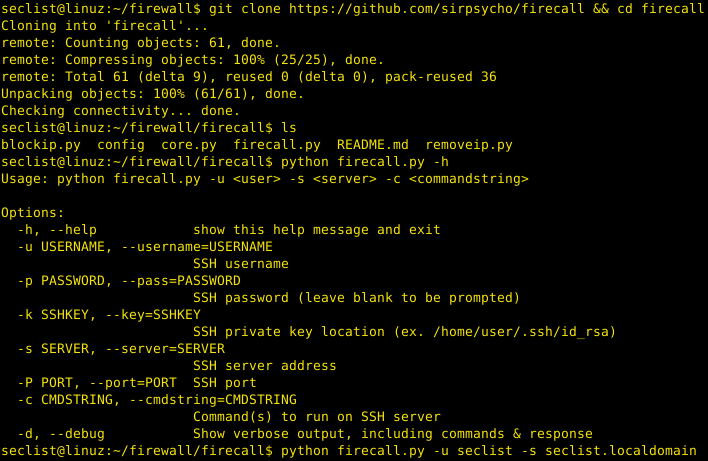 Browse: Home / firecall – Automate SSH communications with firewall, switches, etc. 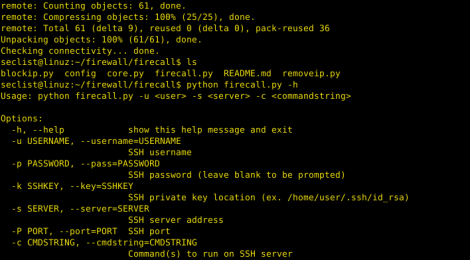 firecall scripts are designed to automate sending commands to a Cisco ASA firewall. The intended purpose here is to eliminate the need to manually log in to a firewall to make changes. This code can be run directly via command line or it can be incorporated into other scripts. These scripts were created with automation/orchestration in mind – if done securely, these scripts could ingest security intelligence data to automatically block malicious IPs based on certain criteria. Before running any of these scripts, open up “config” in a text editor and configure each value as applicable. Make sure to enter one or more firewall IP addresses next to “SERVER_LIST” as well as a username, and any other configurations. ← Euphony is a unifier of malware labels for android.